Charles Owen studied in London at the Yehudi Menuhin School and the Royal Academy of Music. 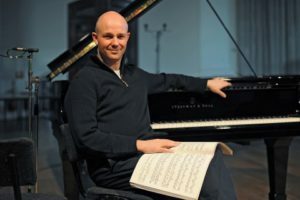 He has won numerous awards including the Silver Medal at the 1995 Scottish International Piano Competition and the 1997 Parkhouse Award with violinist Katherine Gowers. He has appeared at London’s Barbican and Queen Elizabeth Hall and regularly gives concerts at Wigmore Hall. Internationally, he has performed at the Lincoln Center, Weill/Carnegie Hall, the Paris Musée d’Orsay and the Moscow Conservatoire. Charles has been a regular guest at many leading festivals including Aldeburgh, Bath, Cheltenham and Charles has performed concertos with the Philharmonia, Royal Scottish National, London Philharmonic and the Moscow State Symphony orchestras. Charles has established a piano duo partnership with Katya Apekisheva, who is well known to the Amigos. Charles and Katya have recorded the duo version of Stravinsky’s Rite of Spring and Petrushka. He has recorded music by Janácek, Poulenc and the complete Nocturnes and Barcarolles by Fauré. Charles is a professor of piano at the Guildhall School of Music and Drama in London. This entry was posted on Thursday, October 4th, 2018 at 4:08 pm	and is filed under Past Concerts. You can follow any responses to this entry through the RSS 2.0 feed. Both comments and pings are currently closed.